Regina Doherty defended the closure of her company today. 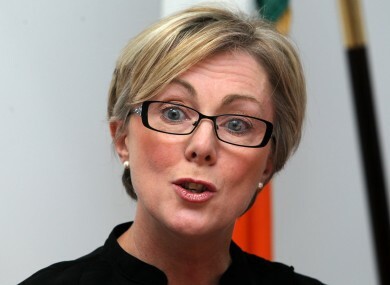 GOVERNMENT CHIEF WHIP Regina Doherty has defended her decision to liquidate a company in 2013. Doherty was a director – along with her husband Declan – of Enhanced Solutions Ltd, a company which bought and sold IT components until it went to the wall in 2009. However, it was not liquidated until 2013. The liquidators’ report shows the company owed €59,000 to Revenue and €50,000 to AIB. The company had lost over €205,000 according to its most recent accounts. Separately, a judgement was awarded against the company by UK firm Eurosimm for over €10,000. Before February’s election, Doherty told The People’s Debate with Vincent Browne that her debts had been paid. However, her promotion to Chief Whip led some to question whether there were debts left outstanding. Last week, Doherty declined to speak to the Mail on Sunday, but today penned a piece in the Irish Independent defending her actions. She also took to RTÉ’s Saturday with Claire Byrne to give her side of the story. Doherty said that she has been “reminded of how much of a failure she is” since the liquidation ended in 2013. She said she and her husband had taken out a loan to pay back AIB. The Revenue debt was part of that written off, some being written off against VAT owed to the company. She says that she has been reminded of the liquidation daily by “people who think they’re smart”. People think they’re smart reminding me of it, but I lived with it. She said that she had ignored the social media commentary on the liquidation until her appointment as Chief Whip two weeks ago. Then, she said, the “interactions went through the roof”, leading the story to “take on a new life”. “I can’t just ignore people saying things about me that are not true. “I can’t have an ambiguity for people – and there can’t be many left, I’m sure – who do actually like me. “I haven’t hidden anything, I’m not happy or proud about what happened. She said that some of the criticism was politically motivated, but added that there was no political party conspiring to organise it. She said that the Companies Registration Office had deemed an auditor’s concerns “insignificant”. “I haven’t broken the law. Yeah, I did liquidate a company and the company did owe people money, but we didn’t get to that space by choice. She said that once she and her husband liquidated the company, they were not entitled to social welfare. “The only reason there was food put on our table was because my parents and Declan’s parents got us through. If I had the money, the company would have been liquidated in 2009, but I didn’t have the money. We didn’t have the money to go to Lidl on a Friday evening. The company was liquidated two years after Doherty was elected as a TD for Meath East. Email “"I haven't broken the law": Government Chief Whip defends liquidation of company”. Feedback on “"I haven't broken the law": Government Chief Whip defends liquidation of company”.